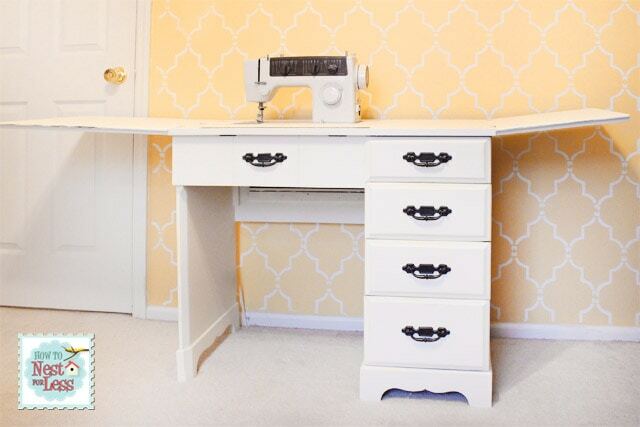 Last week I revealed my new sewing desk makeover for my craft room/home office. 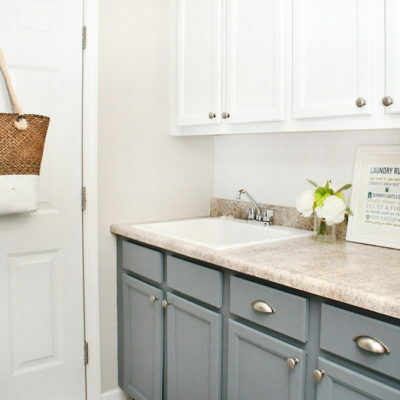 I love the way the white pops of the yellow stenciled wall, but I needed to create some storage above it for all my crafting tools. I’ve been seeing a lot of peg boards recently across the web, so I thought this would be a perfect way to organize my room. 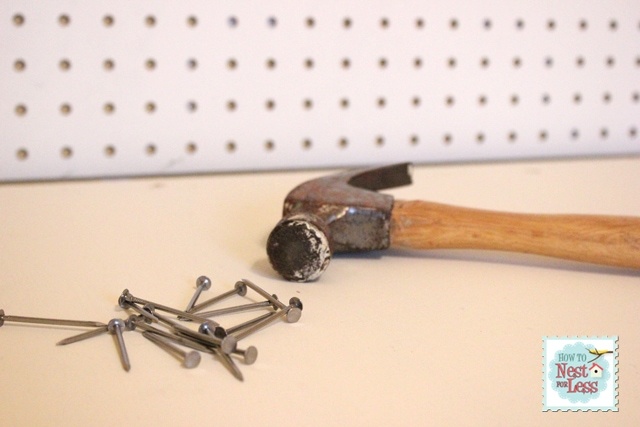 I picked up a piece of 4×8′ peg board from Lowe’s and had them cut it down to size to fit above the sewing desk. I found the studs in the wall and nailed the board into place. Now we’re ready to “make it fancy” according to my 4 year old daughter. 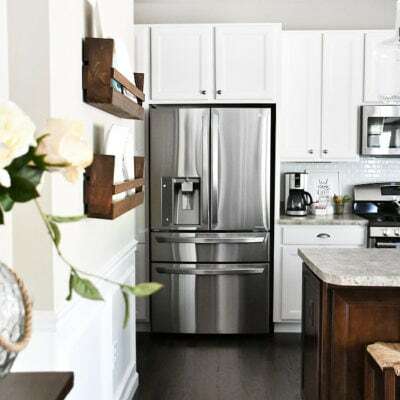 I purchased some peg board hooks from Lowe’s as well. 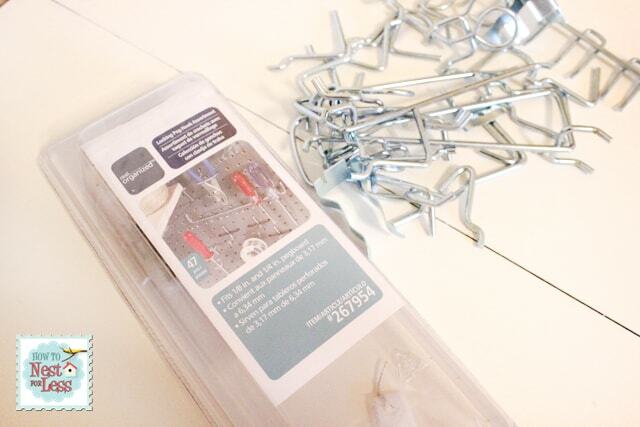 These are extremely easy to hang in place and come in a variety of shapes and sizes. OK, now for some additional bling! I wanted an inspiring message on this peg board as well so I decided to cover some wooden letters in colorful scrapbook paper. I grabbed my mod podge and got to work! I traced out the letters and trimmed them out of the scrapbook paper. 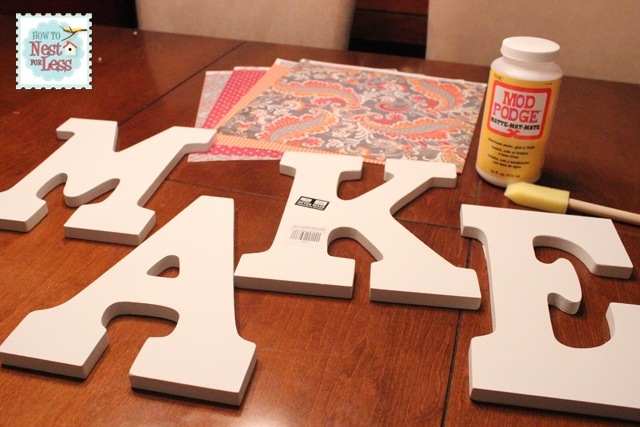 I then used a foam brush to apply the mod podge directly on the wooden letters I bought from Michael’s on sale for $2 each. 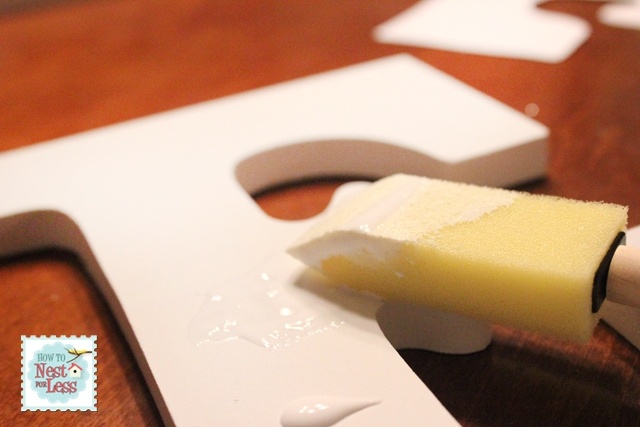 I placed the cut-out letters on the sticky letters and that was it! I used the same technique for the letters on my daughter’s bedroom over 4 years ago and they’re still 100% perfect!! OK, ready for the reveal? Get ready for pHoTo OvErLoAd! Erin this looks fantastic!! I love the letters-great job! 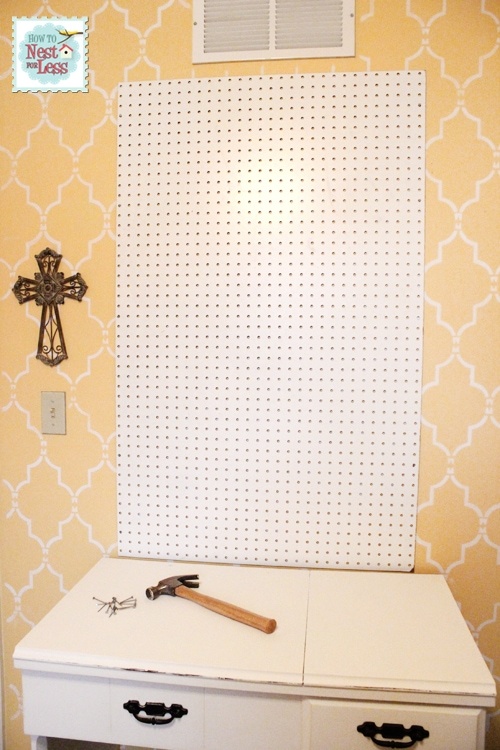 Amazing how a piece of peg board can become such a statement. I love it. 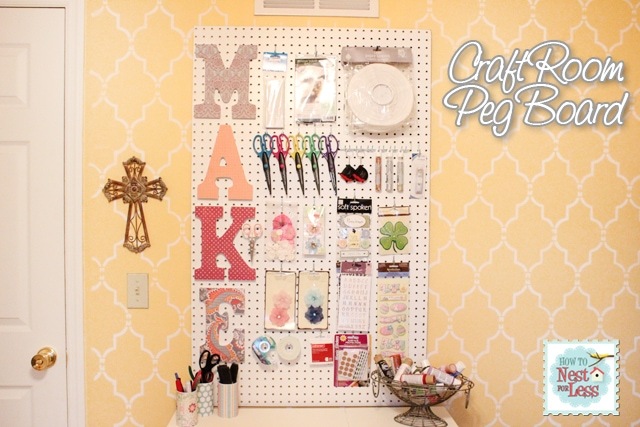 Love the peg board. So organized and it looks so pretty!! So adorable Erin..I love it all!!! Wonderful!!! It must feel amazing to have it all at your fingertips! I love how you used paper to cover the letters. Never would have thought of it!!! Thanks for sharing such great ideas!!!!!!!!!! Thanks CJ! 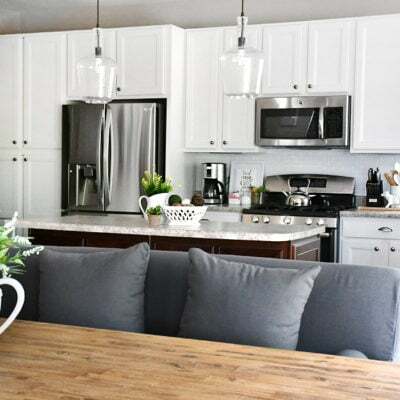 I can’t wait to see your new space!! very cute! 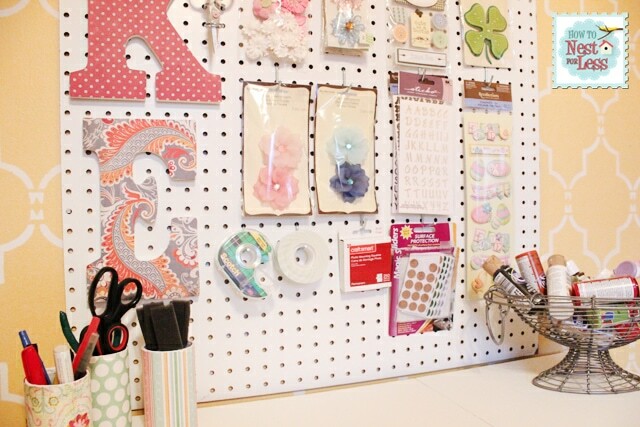 the pegboard give it the look of a workshop – nicely done! 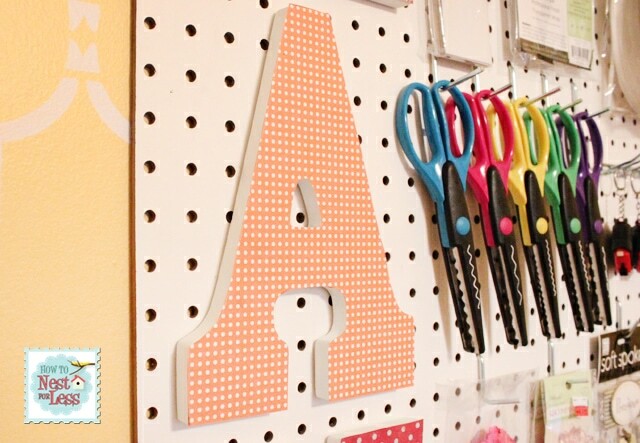 I really like your peg board and the beautiful letters on it! 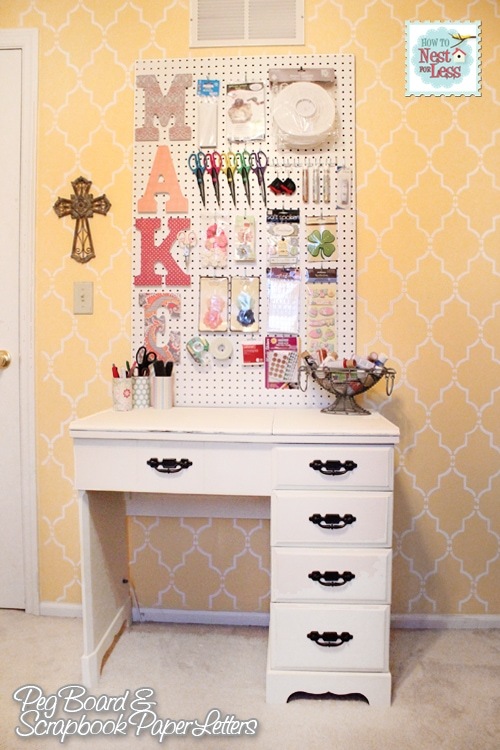 Also, LOVE that yellow stenciled wall! BEAUTIFUL! This is adorable and so functional. I need to do this! Great idea the letters make it cute I can picture a pretty frame around it too. Wow, that’s an awesome way to provide some storage and some “art” work! I love it, great idea! Thanks so much Jami Leigh! Thanks for linking up to last week’s Tuesday Confessional. 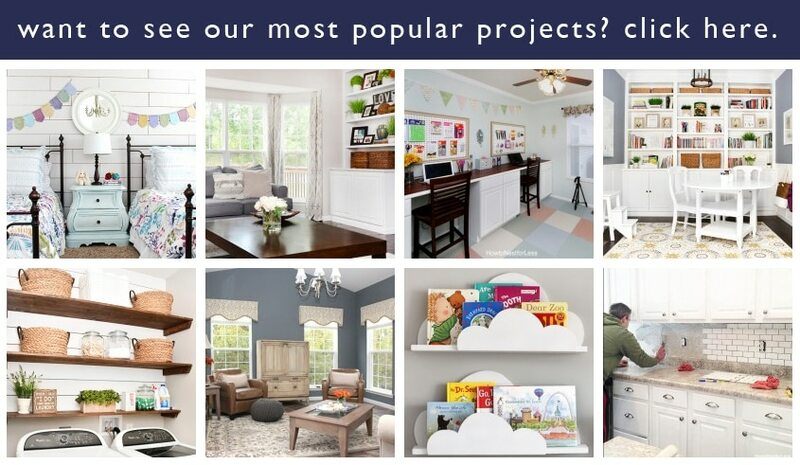 You’ve been featured so stop by and grab a brag button! I just love this. I will be featuring it tonight at my Winter Blues Wednesday party that opens at 8pm EST. Please stop by and pick up an I’ve Been Featured button. Thanks so much. Featuring YOU tonight over on my blog. You were one of the top view links at last week’s party. 🙂 Thank you so much for linking up! YAY!!! Thanks so much Ginger 🙂 I appreciate it!! 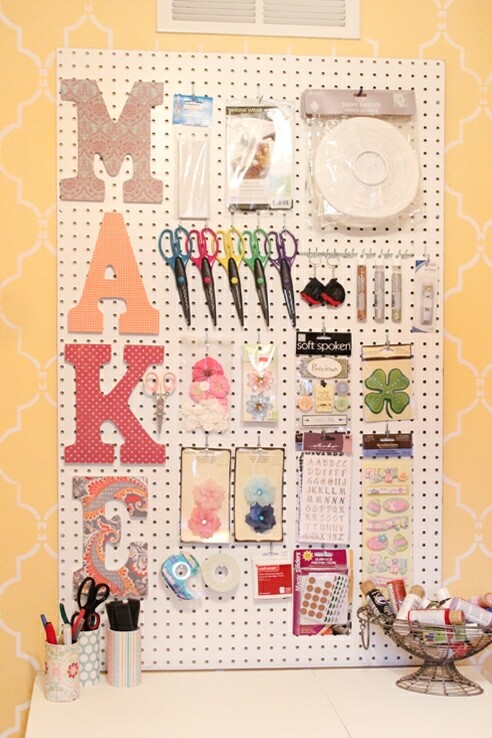 Now…that is one pretty peg board!! Looks amazing! Would love for you to stop by and link up! I pinned this to my Scrapbooking Room board. 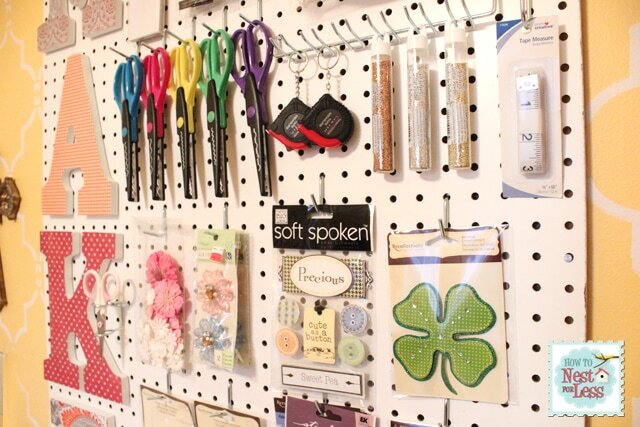 I have a huge blank wall in my craft room, and I’m gathering ideas for it. 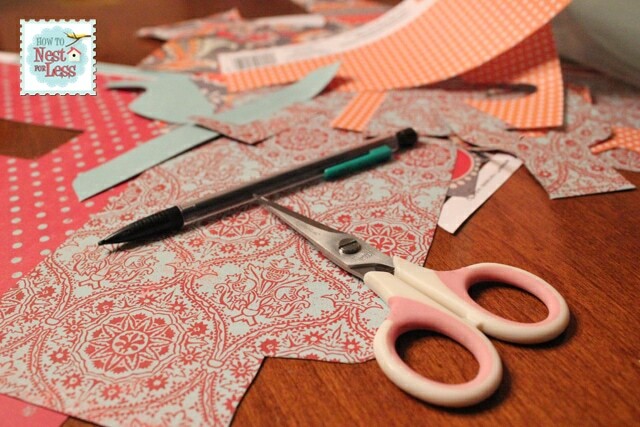 Thanks for sharing this on Gingersnap Crafts and congrats on being featured.